In Filipino cuisine, a lot of soups are served as main dishes often paired with rice. Sinigang, tinola, nilaga and bulalo are just a few examples. In the sinigang na sugpo recipe, sinigang is a generic term for a wide array of sour soups in the Philippines. The souring ingredient can be tamarind, ripe peeled guava, or kamias. The main ingredient can be beef, pork, chicken, fish or shrimp. The vegetables can be talong (eggplants), kangkong (swamp spinach), sitaw (yard-long beans), talbos ng kamote (sweet potato tops), labanos (radish) and gabi (taro), or all of them, and finger chilies. Whether or not you use meat in sinigang, the cooking procedure hardly varies. The aromatics are sauteed, the meat is added, water is poured in, and when the meat is almost done the vegetables are added and everything is boiled together so that they all cook at the same time. The only variable is when to add the souring agent. Fresh tamarind juice (or commercial sinigang mixes) are added just ahead of the vegetables; whole young tamarind, kamias, or guava are added a bit earlier to allow them to soften and release their acid. 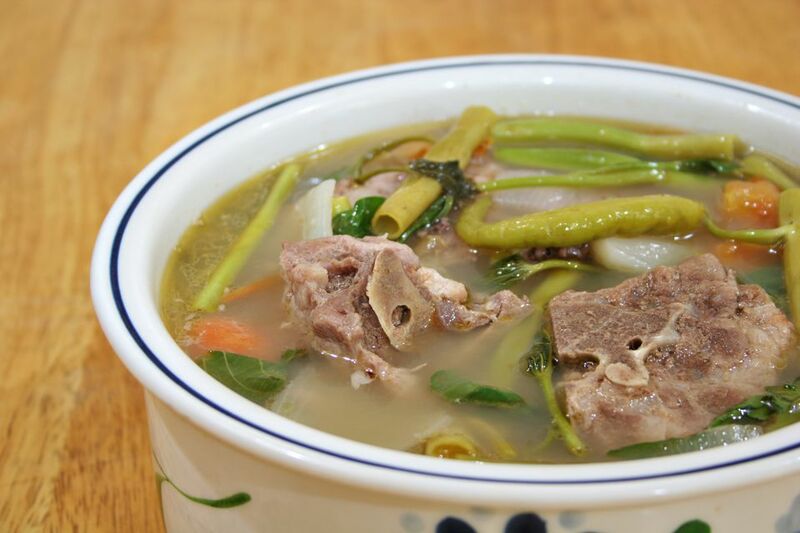 If you intend to serve the sinigang primarily as a vegetable soup, the important thing is to have the best quality broth you can make and the freshest vegetables to go into it. A good meat broth means bones — lots of bones. If, however, you intend to serve the sinigang as the main dish, you need meatier cuts of pork. Otherwise, you’ll be practically serving rice with broth and vegetables and very little meat. A practical way to have your cake and eat it too is to use a combination of pork cuts. Alternatively, you can prepare the broth separately by boiling lots of soup bones with spices then use the broth for cooking sinigang. The second option is especially good if you want your tureen and soup bowls to contain nothing but meat, broth, and vegetables instead of having them cluttered with large pieces of bony pork. Just fish out the bones and discard when the sinigang is done. The third option is to use a cut of pork that has enough bones to flavor the broth and also enough meat so that the sinigang can be served as a main dish. Pork tail is one such cut.